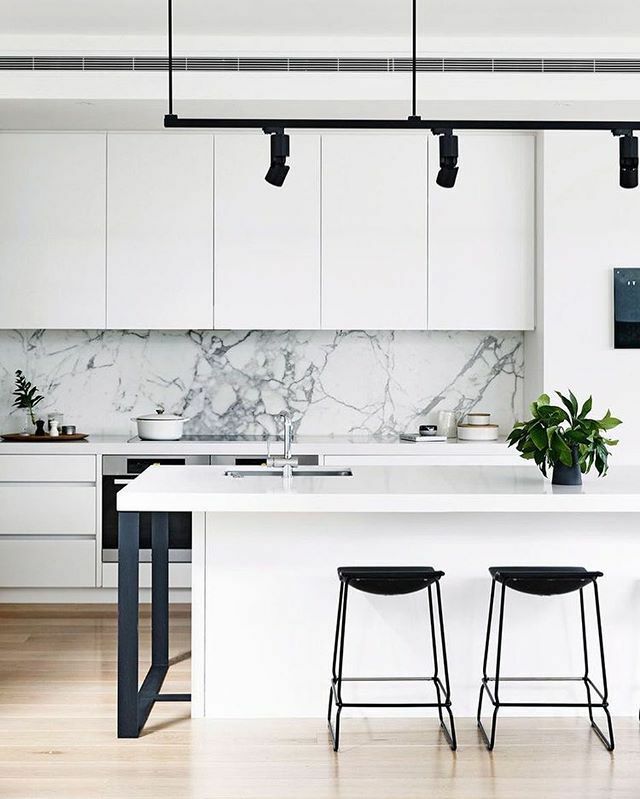 A kitchen is often the part of the home where all the family gathers, where you host parties and create culinary delights – so it’s no surprise that when your kitchen space starts to look a little dated that you want to transform it into a modern space. A streamlined, contemporary kitchen design, combined with integrated appliances, thoughtful lighting and a mix of levels that helps to keep your room clutter free whilst leaving you more space to relax and entertain might sound like a dream – but it can be a reality. Contemporary kitchen designs incorporate clean lines, from worktops and cupboards to appliances. The in-frame construction of handleless cabinets gives your kitchen an edge on some flat fronted designs and makes it extremely durable. In smaller kitchen spaces, the absence of handles helps to make a room feel bigger, while in a kitchen with lots of cabinetry, it prevents an overload of steel handles. If you don't want to commit to all handleless doors then you can give a run of classic cabinets a modern edge by dressing them with sleek bar handles, adding modern built-in appliances and topping with cool composite worktops. For added contemporary chic, mix and match styles incorporating flat-fronted wall cabinets. Continuing the theme of clean lines, if you think of yourself as quite the next master chef and have your heart set on a range cooker, choose one of the more modern steel models from Mercury, Smeg or Rangemaster. Integrate as many appliances as you can as clean lines must continue across appliances too. If possible, place items such as washing machines and tumble dryers in utility rooms. Keep sightlines clear by installing simple below cabinet, in-ceiling or pop-up extractors rather than fancy hanging pendants, keep fridges and freezers behind closed doors and invest in good-looking, hardworking built-in cooking appliances and a sleek glass zoned induction hob. Finish off with a few modern day luxuries such as a boiling water tap offered by Quooker, pop-up power points and cool lighting. It’s easy to collect kitchen paraphernalia, but do you have storage space for it all? Whilst it’s good to have a focal point in your kitchen, and make a statement, it doesn’t necessarily work for all kitchen paraphernalia. Focus on one appliance, a KitchenAid mixer for example. The key to maintaining the clean lines in your kitchen is keeping it uncluttered. Hiding kitchen clutter, particularly in open-plan kitchens is essential, so plan in plenty of storage with deep pan drawers, tambour units to keep small appliances, crockery and china out of site. Floor to ceiling handleless cupboards can hide a multitude of sins so if you have space, they’re a good investment. Remember, though, for your kitchen to work efficiently, you’ll want easy access to all these things when you do need them, so we recommend siting pan drawers by ovens, larders close to prep areas and china close to the dishwasher. Kitchen colour worktop choice has grown over the past few years to include everything from pure brilliant white to zingy orange – and the beauty of a contemporary modern kitchens is that both plain white and vibrant colours look great on kitchen worktops. If you want a slightly less clinical feel to plain bright white then manufacturers such as Silestone and Ceasarstone are now producing man-made composites that look like natural materials. Of course, while they can look just like marble or concrete, the real benefit of these surfaces is that they are much easier to look after than natural stones, particularly very porous ones such as marble. They’re also fabulous for creating feature splashbacks – for instance book matching a faux marble – with less of a financial outlay than, say, Carrara. An island is normally a central focal point in the kitchen, so think about adding a high breakfast bar for relaxed eating or create several levels on a peninsula with a raised area to hide the washing-up from dinner guests. Plinth lights are a great way to be creative with your lighting – they help create the illusion that base units are floating, or add LED strips to the interior of wall cabinets or shelves to highlight favourite accessories. They can create the perfect mood in the kitchen. Try wrapping a composite work surface in a contrasting shade or material around cabinetry on islands and at the end of runs or create an illusion that your units are a piece of furniture with ultra-thin worktops for an ultra-modern finish.